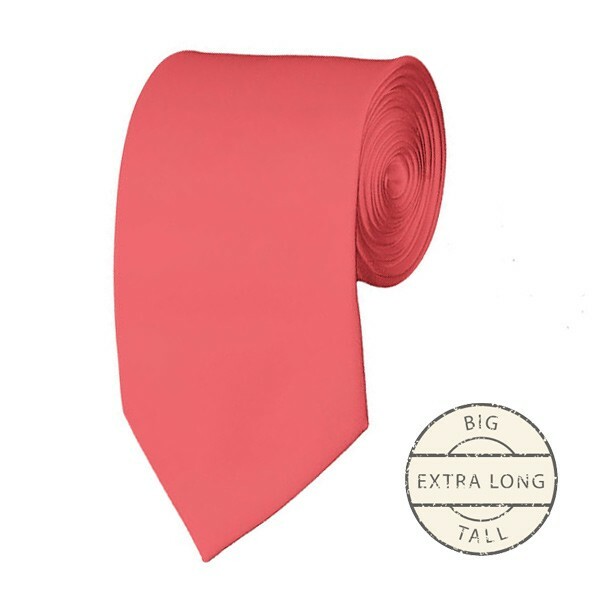 This extra long solid coral rose tie is for the big and tall guys. This extra long tie measures in at approximately 62 inches long. Our coral rose solid colored neckties have proven popular with schools, choirs, sports teams, embroiderers and individuals looking for a basic tie at a discounted price. Sporting a luxurious satin finish with just the right amount of sheen, our solid coral rose 3 and 7/8 inch necktie features a full lining to provide superior body & feel to the necktie, allowing it to make excellent knots and last for years of service. Solid coral rose ties are available in many different shapes, shades and styles. This coral rose tie is a beautiful shade of pink. The material is satin finished with a medium amount of sheen, which means it does have some shine, which creates variation in the exact shade/brightness that is shown at any given moment, depending on the amount, type and angle of the light hitting the tie. If the exact shade of this necktie is a concern, please read our color matching section to help. This coral rose tie is extra long and is scaled to match the current fashion trends, when worn by a big and tall guy. This means that this extra long tie has a traditional tie shape and would look great with a jacket or without. The width of this extra long tie is approximately 3.75 inch inches right before the tip, which keeps the tie looking like a standard size tie. The tie is approximately 62 inches long, which is standard extra long adult length and should fit most slightly larger / taller than average guys, depending on their build.